Majestic 3D Birds is a Special Edition unlike any other collection you’ve ever seen! This collection allows you to bring these magnificent birds to life with 3-dimensional feathers, vivid thread colors, and extraordinary detail. 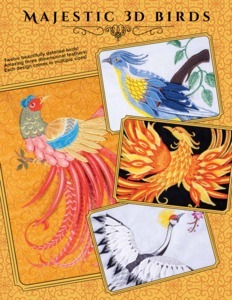 There are 12 birds in this collection including the regal swan, the brilliant bird of paradise, the resplendent peacock, and even a fiery and fierce phoenix. These birds will look beautiful on home décor like pillows, and will be absolutely striking framed and mounted on your wall. They are the perfect embroidered addition to create unique garments and accessories. No matter where you stitch these beautiful and amazing 3-dimensional birds, you’re sure to impress anyone who sees them!